Angers, France – It’s quite a contrast; the university town of Angers and the countryside around it. From a tidy, nearly shiny, university town exuding white washed, business-like utility to rolling vineyards along wide and lazy rivers overseen by magnificent chateaux depicting a gilded age. These remarkable edifices, confidently bold, were once the seasonal homes for royalty and their treasurers. Today they might be held and maintained by the state; some still remain the possession of the uber-wealthy. A few centuries ago, Ben Franklin famously wiled away his ambassadorship chasing skirts in one of these castles, to the enduring distaste of John Adams. Today, these monuments still rule over the vineyards and grain fields stretching in every direction. But the contrasts don’t end there. The Loire Valley’s agricultural lands are marked only by tawny roads, often straight, often following the contours of the gentle slopes, adding to the measured look of vast order. There is a distinct lack of visible buildings. Here in the midway point of the river’s languid flow to the Atlantic, many of the wineries utilize caves for their wine storage – ancient, humble caves carved from the soft tufa. A friable, sandy soil bound together by sticky limestone, tufa provides a distinct soil underpinning the Loire’s venerable vineyards. 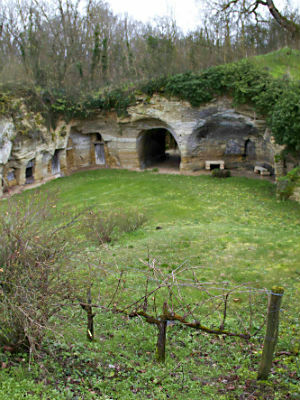 These caves have held not only wine, but people too. For millennia, these inhabitants of these porous dwellings have been called troglodytes. It’s not a loaded term here; it’s merely a description of a way of existing, and some caves still provide shelter for the downtrodden or even a few seeking a simpler way. Instead I’m touring caves where wine is made and stored for sale in international markets. In these parts, Chenin Blanc is the white grape of choice for most. For enthusiasts like me, it’s a grape capable of greatness primarily (if not solely) in this part of France. In the central part of the Loire Valley, Chenin rises to remarkable excellence; often on the tufa soils, but other times with slate underpinning the best vineyards, especially with wines such as Savennieres, dry, earthy and powerful. But ubiquitous in American stores are Chenin Blancs labeled as Vouvray. Some are dry, most are slightly sweet and some are even produced as sparkling wines, sappy and refreshing, without all the bombast and richness of classic Champagne. That gentle character may explain why Sparkling Saumur and Cremant de Loire, as these bubblies are labeled, have never been a big factor in the U.S. market. It can’t be the prices; they’re quite reasonable. That’s true of all Loire Valley wines: from the tart, bracing Muscadets made at and near the Atlantic coast to the fragrant, nearly lusty Sauvignon Blancs produced near the other of the river in Sancerre and Pouilly Fume (the 2012 vintage is particularly fat and lush). Aside from a few cultish brands, none of these wines will set you back much (see prices below). It’s part of the reason I was keen to visit. But as usual, I learned far more than I expected: I thought Muscadet a pleasant wine, even interesting at times. It’s usual devoid of personality, or so I have foolishly thought over the years. It’s subtle stuff, yes, but I found here great Muscadet, even though I would have scoffed at those words before my visit. Made from a grape that announces its ├⌐migr├⌐ status in its name, Melon de Bourgogne (of Burgundy, that is), it’s more at home along France’s sea-sprayed northwest coast. Notes of salt, lemon, lime skin and tart, green apple prevail. With the region’s oysters, mussels and other shellfish, it’s as if a simple lemon squeeze has been transformed into a sauce, a garnish and a counterweight. Even this breadth of grapes and places doesn’t begin to describe the variety of wines the long Loire Valley produces: spicy, tart red wines, tangy roses, and the most lush and unctuous of dessert wines. Despite stark contrasts between wines and styles, the wines all represent excellent value and if you thirst for some crisper and lighter styles in wine, you need to slake that thirst with some of these.